Hi! This is Eve Mayberger and I am a curriculum intern from New York University. I am currently spending nine months at the Penn Museum as part of my fourth-year internship. I want to introduce one of the projects I am working on in the Artifact Lab. 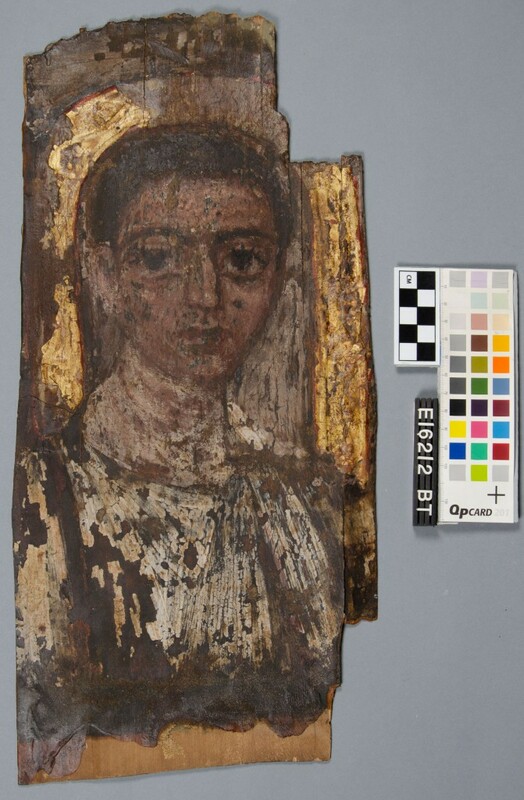 The Ancient Panel Painting: Examination, Analysis, and Research (APPEAR) project is a Getty Institute initiative to create an international database on Fayum mummy portraits. A website was created to allow different types of analysis and imaging to be uploaded and shared with other institutions participating in the APPEAR project. 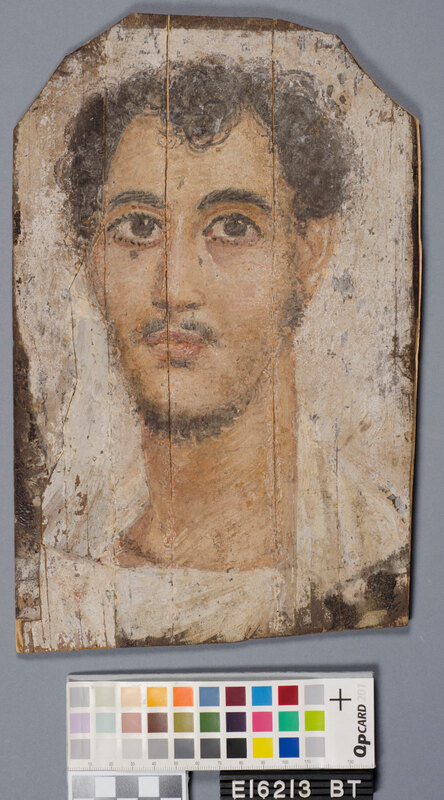 The Penn Museum has three Fayum mummy portraits in its collection [E16212, E16213, and E16214]. 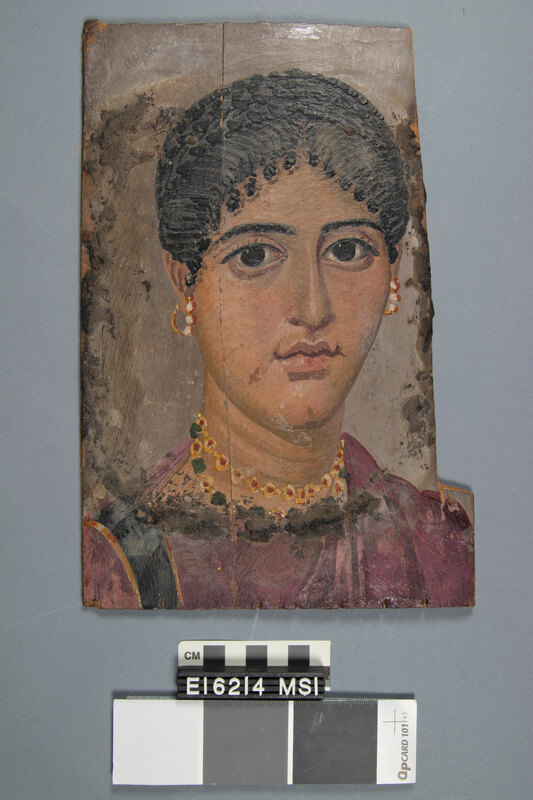 These portraits date from the Roman period in Egypt and were executed in either encaustic (wax) or tempera. The portraits depict a boy, a young man, and a woman. The figures are painted on thin panels of wood that are adhered together. Remember that wood was a rare and expensive material in ancient Egypt and every tiny piece of wood was valuable. All three portraits have been repaired at some point in their history. One of my challenges is going to be to differentiate the original materials from later additions. Fortunately, the Penn Museum has the old treatment records that will hopefully be useful to piece together the treatment history of these objects. After carefully examining the portraits, I took them down the photography studio in the main conservation lab. These high-resolution photos will be uploaded to the APPEAR website. In the upcoming weeks, I will be using imaging and non-destructive analysis to further investigate these mummy portraits. Be sure to visit the blog in the upcoming weeks to read more about APPEAR project! The Penn Museum Archives is an incredible resource for us here at the museum. When we begin working on objects in the conservation lab, we carry out preliminary research, which often includes searching for related materials in the Archives. Among the materials we may be interested in are archaeological field notes, letters between curators and archaeologists or collectors about the acquisition of specific artifacts, and old photographs. 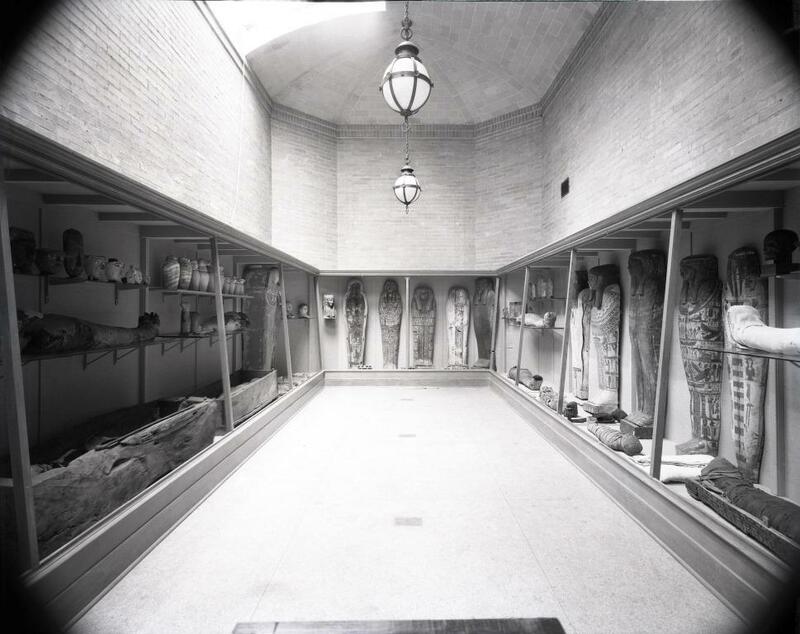 Recently, Senior Archivist Alex Pezzati scanned some images for me, including this one, a shot of the Egyptian “Mummy Gallery” in 1935. 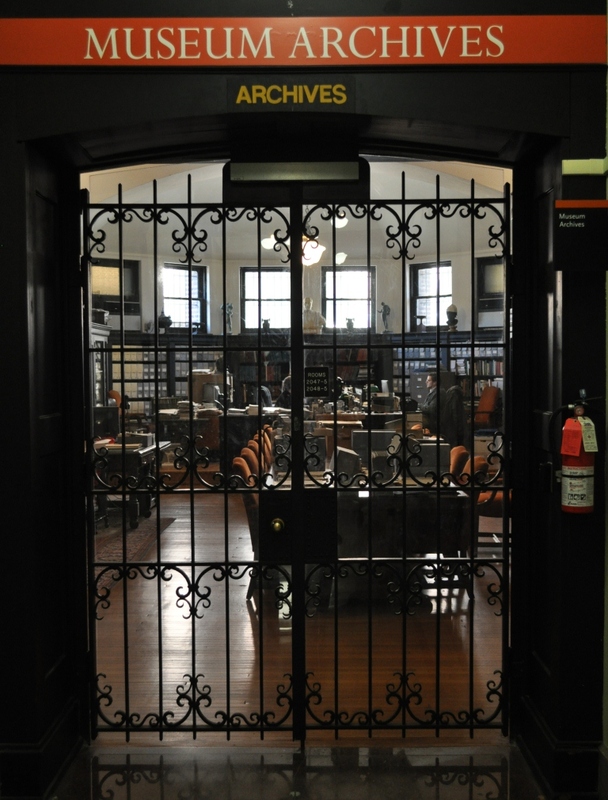 I was excited to see some of the artifacts we’re working on in the Artifact Lab right now in this photo. Can you pick some of them out? In the image below I’ve circled some of them in red. These old exhibition photographs can be extremely valuable to conservators. 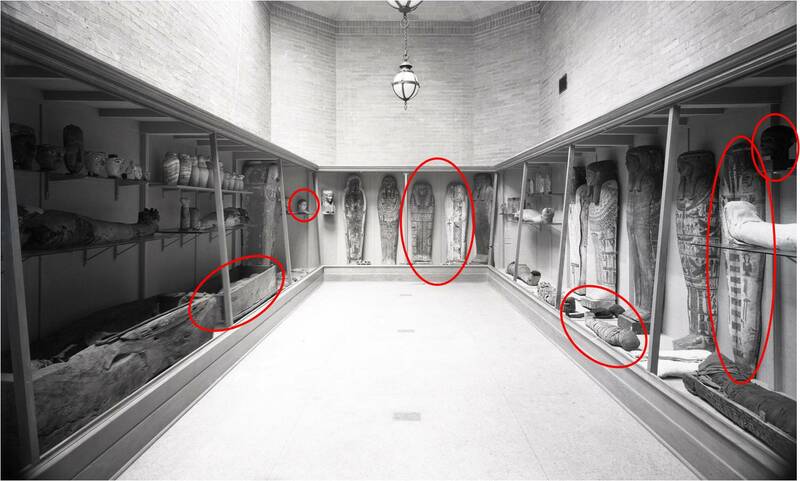 Not only does this particular image tell us that certain artifacts were definitely on display, and when (which may not be recorded elsewhere), but it also shows us how they were displayed. In some cases, seeing the way that artifacts were previously displayed may help to explain damage, such as excessive fading on one side or adhesive residues left behind by an old mount. We can often make good guesses about this type of damage, but it’s always nice to have some proof! What particularly excited me about this photograph is that it shows the coffin of Tawahibre in the gallery. We are currently working on this coffin in the lab, but it is still too fragile to separate the lid from the base to allow for examination of both pieces individually. 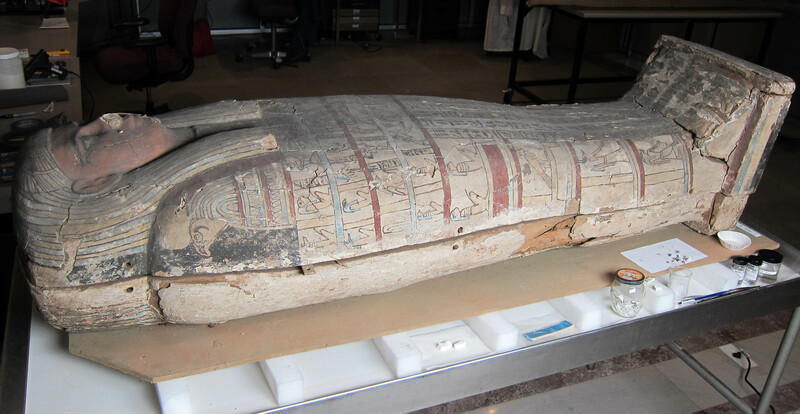 The coffin of Tawahibre in the Artifact Lab. Just recently, Curator Dr. Jen Wegner was up in the lab and we were discussing the coffin and some of my observations, and she wondered out loud if the back had any text written on it. I had wondered the same thing myself but I knew that until we carried out further work, we wouldn’t be able to know. BUT, since this 1935 photograph shows both the lid and the base of the coffin on display, we don’t have to wait any longer! 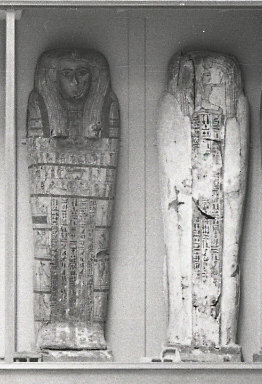 The lid and the base of Tawahibre’s coffin, side by side in the Mummy Gallery in 1935. 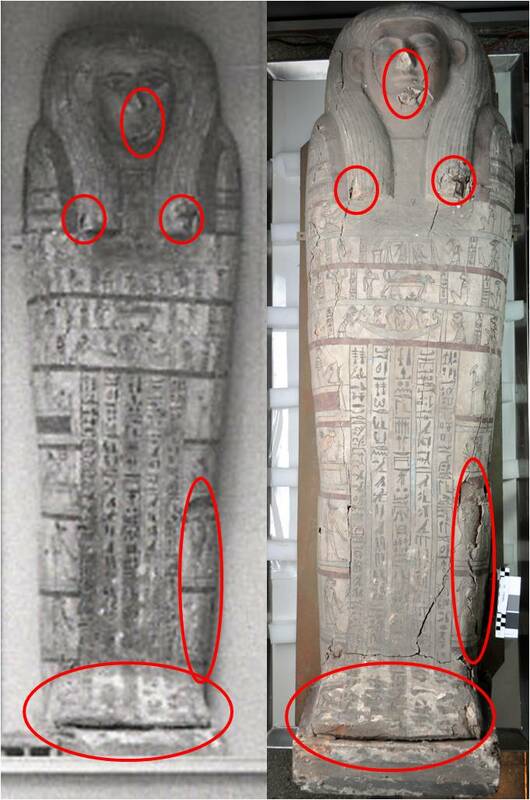 Another thing that is useful about this image is that is shows that much of the damage we’re seeing on the coffin today was present in 1935. This includes both major structural damage and extensive paint loss in areas. It is likely that the coffin came into our collection with this damage, which is somehow reassuring to me. I will also note this in my documentation. Tawahibre’s coffin in 1935 (left) and today (right). Much of the major damage we see today had already occurred by 1935. To highlight this, I’ve circled some of the damaged areas in red in both images. We continue to plug away on the treatment of the coffin and we are hoping to soon reach the point where we can separate the lid. I will provide an update shortly about some of the more recent work we have been carrying out on this artifact! Velina Acosta on Ask us!